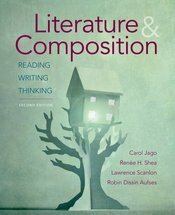 The only book designed specifically for the AP® Literature and Composition course is back and even better. Organized thematically to put meaning first, Literature & Composition offers a wide variety of classic and current literature, plus all of the support students need to analyze and write about it—for assignments and on the AP® Literature Exam. The book is divided into two parts: instructional chapters that teach students the skills they need for success in an AP® Literature course, and thematic chapters the let students explore amazing literature while honing their reading, writing, and analysis skills.